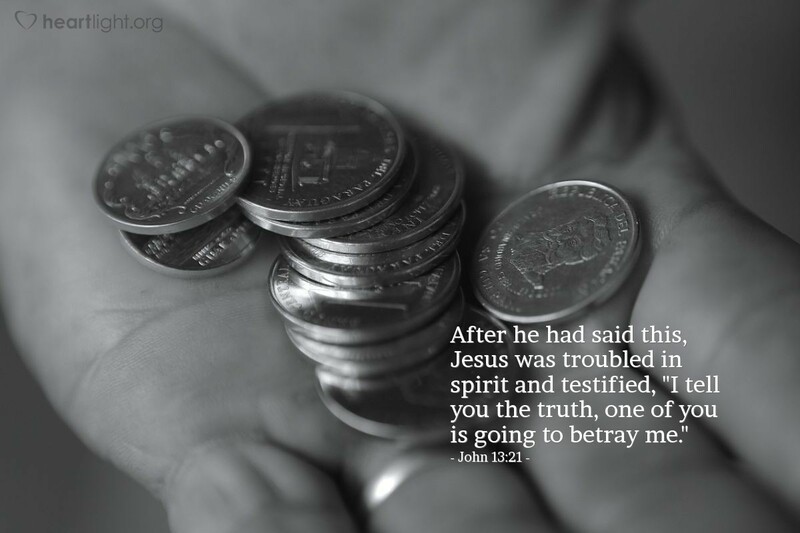 I can still remember my friend saying it in church one Sunday: "We think so badly of old Judas for betraying the Lord for 30 pieces of silver, but how many times do we betray him for nothing?" Ouch! What makes this so difficult for us to bear is Jesus' anguish knowing one of his own would betray him. Let's make every effort and call upon God's strength so that such betrayal can never be true of us! And if it ever is, let's make sure we run toward his grace with an honest desire to escape sin and come back to him! Jesus, I am sorry for the times I have broken your heart with my rebellion and neglect. Father God, I apologize for my lack of passion and zeal for your Son's sacrifice that saved me from sin and death. I want to live more vibrantly for Jesus so others may see him and come to know him. It is in his precious and holy name I pray. Amen.